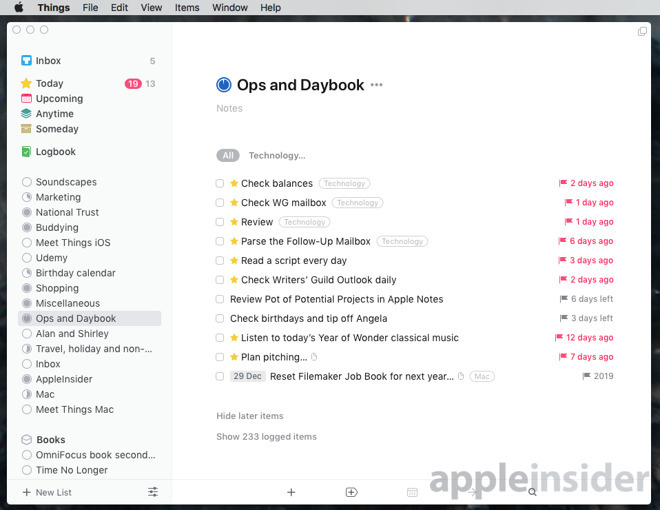 Things 3.4 for Mac, iPad and iPhone has always been in the top tier of To Do apps for its features and especially its design. With this new update, the suite has introduced methods to connect your tasks into other apps. You can speed up recording your To Dos and app developers can send your work directly into Things 3.4. It's an update whose significance is going to take some time to really appreciate. Right now the tools fit in very well with the To Do app's excellent design, but it's going to be when other developers take up the new options on offer that it's going to feel as significant as it is. All of the new options service the core purpose of Things 3.4 which is to be the one place you keep all the To Do tasks you've got on your plate. Things is all about getting those tasks recorded quickly and then showing you just what you need to do next. The makers Cultured Code say that what's new boils down to three features but as important as they are, really they're different flavors of the same one. Together they aim to improve how Things now works with other apps and to show how that can be made to be extremely useful. The simplest new addition to Things 3.4 is what's called Handover from Other Apps. The idea is that when you've worked out what you want to do with a tool like an outliner or a mind mapping app, you can get that software to send your thinking over to Things. So now when you finish your visual mind map, MindNode can send the whole thing directly into Things to make a new project with a series of tasks. 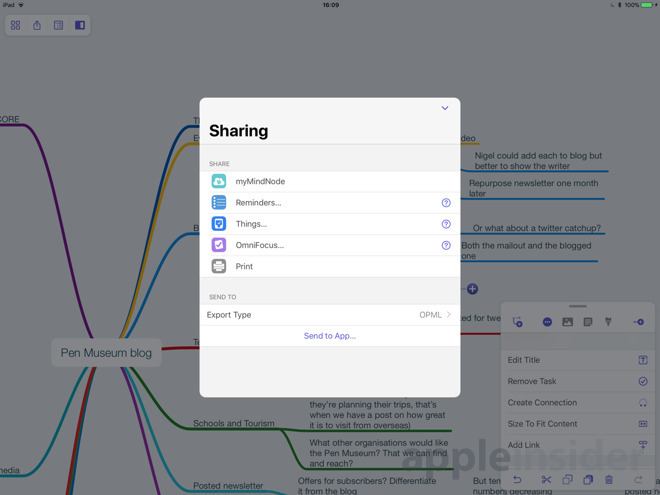 You've already been able to do this by sharing the MindNode map into Things rival OmniFocus. It's really just saving the map's text and structure in a format called OPML that many apps can make. Here, though, you don't have to think about formats and you can include notes that all get passed over to Things for you. MindNode is the first example of an app that has been updated to use Things 3.4's new tools but others are coming including this week's update to Workflow and the forthcoming Drafts 5. 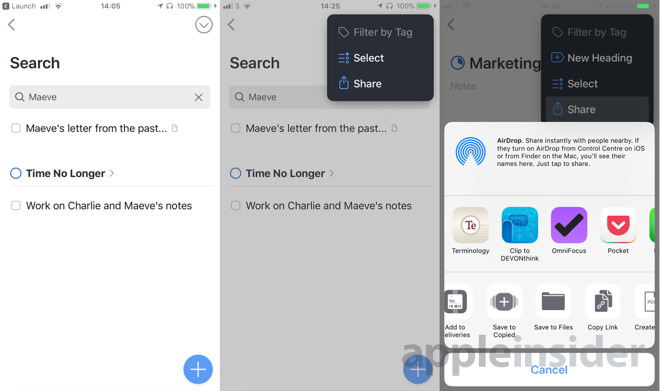 As well as sending your work into Things 3.4 to create tasks, other apps can go the other way and dig into your To Do list to show you parts you ask for. So for instance, say you're working on a large project like an office move. You've got tasks for that, other people have their own To Dos and you've also got to keep a lot of information. 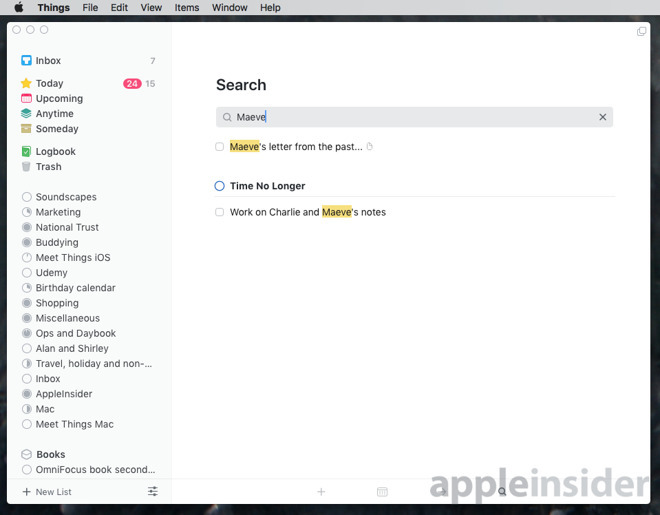 You could have all your information in Apple Notes and be able to leap right from a document in there to your To Do list. In Things 3.4 for Mac or iOS, you open a project: a list of tasks to do with a particular job. 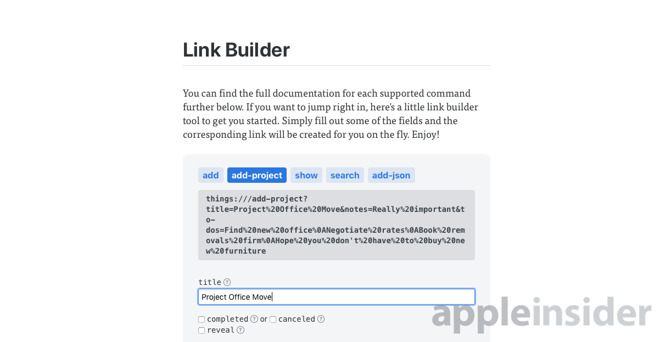 Then you just click or tap to copy a link to that specific project. On the Mac, you right-click anywhere in it and iOS you tap the icon of a downward-facing arrow in a circle to get Share. This is just the regular iOS Share feature but when you use it from within Things, you get an option called Copy Link. Tap that and Things copies a link to that project. 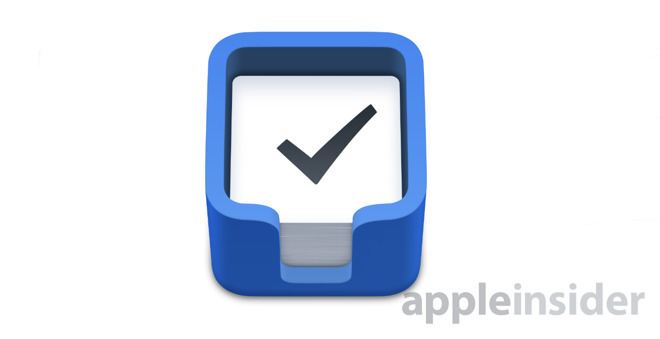 You can paste it into a note for reference or you can use it in a separate app like Launch Center Pro. Use it to make a button that you press to automatically jump to this particular project. The link is what's known as a Callback URL that you may already know from many iOS apps that use it. What's great is that if you do this on your iPhone and later read your Apple Notes on your Mac, clicking the link opens Things - on the Mac. What's less great is that callback URLs are a bit of a fudge and while you do get used to them quickly, it's still fiddling about with Things instead of getting on with your work. The same system, though, is what brings a new level of automation to Things 3.4 and that's somewhere you can immediately see the benefits. Say you have one particular job to do that repeats every time you get a new client. You used to open Things, make a new project, write the deadlines in and then a long list of tasks. Now you can have a link that when you click it, does all of that for you. That means less time on the administration of a new client and so more time doing your work for them. True, the link to do that creating a whole project and many tasks is complex. However, Cultured Code provides an online Link Maker tool. That steps you through various options and builds the link for you. It's not very convenient having to go through a website Link Maker and it's no better having to remember how to write these links yourself. However, this isn't something you're meant to create a lot, it's something you're supposed to make once and use repeatedly. So the time spent learning how to do this is going to be recouped by how quickly you can set up a new client project or so on. The sheer power and speed of being able to do all this automation and linking to other apps is a great feature of Things 3.4. However, what's greater still is how well it all fits in to the existing app's design. It fits in so well that you never have to look at a Callback URL if you don't want to. You never have to work in another app and send work over to Things. If you do, though, you speed up your work in Things dramatically, but you aren't forced to do it or to learn anything when you want to be working. Like all the best To Do apps, Things works to cut down how much time you need to spend in the app instead of doing your work. One element that makes this work well is how quick it is to add a new task when you're in the app. Forget sending work from other apps or automating the creation of projects, when you just open Things and want to jot down a new To Do task, it is fast. It's also powerful and particularly on iOS. Say you want to add a new task to your Office Move project. Just tap a big blue icon and start writing. Only, say you already have a hundred tasks in there and this new one needs to happen soon. Rather than tapping the blue icon, you press and hold it, then drag up to where you want the task to appear. Once you've used it, you'll never want to use anything else. Design touches like this that both look great and feel so natural are what makes Things 3.4 stand out. Then instead of a long list of tasks weighing you down every day, Things will display your To Do jobs in sections called Today and This Evening. It just makes things feel more manageable and it makes everything look very good. The look of the app is so classy that it's enough to make you consider switching to Things from other apps. It's good enough that it makes OmniFocus look old. Plus, Things does include a feature that helps you import tasks from OmniFocus so in a few minutes we were able to transfer thousands of tasks into it. The only problem is that Things lacks what's called a Review feature. This is part of the Getting Things Done methodology that many apps said they followed and very few did. Things was one that did most of the elements of GTD but it's never done Review and it makes a difference. Without it, you've got these dozens or hundreds of projects and you never look at them unless a task pops up with a deadline. The GTD Review idea has you set aside a regular time to go over every task in every project. It puts everything back in your head long enough for you to make big decisions about whether to do something or delete it. OmniFocus handles the Review well: it prompts you through so you do always do it. More, you're guided so if you break off to do something, you're not left trying to guess which bits you've reviewed yet and which you haven't. In comparison, Things can become this giant pot of tasks that you don't stir properly and it feels like it makes To Do work unnecessarily more fiddly. That said, you can't get enough of the design of Things: just adding tasks or checking them off as done is very satisfying in it. Things 3.4 for Mac requires macOS 10.11 or later and costs $49.99 from the Mac App Store. For iPad it costs $19.99 in the App Store and requires iOS 10 or later. Things for iPhone also needs iOS 10 or later and costs $9.99 plus it includes a version for Apple Watch.